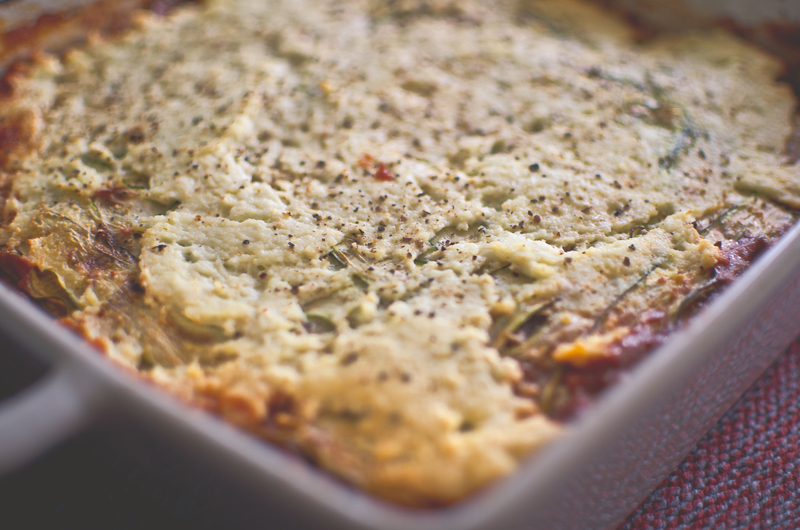 A vegetable layered pie is sort of like a lasagne, crust-less quiche, casserole sort of dish. Instead of sheets of pasta I used beautiful layers of vitamin pumped vegetables. You can prepare this on a Sunday evening and have the leftovers as a lunch in work or it’s a great dish if you have guests coming around because it’s so simple to prepare. Either ways it is a comforting dish to devour and maybe sneak a glass of pinotage in as a treat (one glass not the bottle). I prepared sweet potato mash to accompany the dish. I boil them up and then pop them in food processor with some coconut oil, black pepper and salt, delicious. Also chop some avocado, squeeze of lime juice and a sprinkle of pink salt; perfect combo. This dish is grain free, gluten-free and contains a good balance of macro and micro nutrients. There is also a good balance of fibre. 1 tin Tomatoes or make your own tomato sauce using a punnet of tomatoes and blitz them in the food processor. Preheat oven 180 degrees. Grease casserole dish with coconut oil. Vegetable Layers: wash, peel and chop carrots. Chop the eggplant and place on a plate and sprinkle salt over; this will drain the excess water. After 5-10 minutes rinse and pat dry eggplant. Lightly fry medium heat (1 t sp. coconut oil) until soft and golden brown. Wash and chop the mushrooms. Wash, top and tail courgette and peel in ribbons/strips using the vegetable peeler. Meat Sauce: In large saucepan add 1 tsp. coconut oil, finely chopped garlic, mince and spices, allow mince to brown. Add tomato sauce bought or homemade. Season. Layering: place chopped carrots on the bottom, meat sauce, eggplant, meat sauce, basil and mushrooms, meat sauce, courgette ribbons. Drizzle a small drop (1 tbsp.) coconut oil over the top and cracked black pepper. This will keep the courgette from drying out. Pop in the oven for 35-40 minutes. After 20-25 minutes remove from the oven and sprinkle ricotta cheese, over the top, pop back in for 15-20 minutes – golden brown. Allow to cool. Serve with sweet potato mash, mixed green salad, chopped avocado, whatever your darling taste buds desire.